Day by day, Fiverr is changing the game. This global online marketplace brings together people looking for countless goods and services, and the creators (or “doers”) who can make it happen for them. This marketplace features merchants who specialize in fields ranging from logos to website design, with the contracts starting at $5 (hence the name). Fiverr’s bread and butter is facilitating real-life solutions. You’re on the job hunt and need to revamp your resume but have no clue how? On Fiverr you can find countless people with an eye for resumes and graphic design who can design you an eye-popping resume for as little as $5. Or say you’re opening a food cart but you need a professional, catchy logo that will make you stand out at the next festival. Fiverr can make that happen. One of Fiverr’s unsung qualities is as one of the internet’s most-extensive marketplaces for website design. If you’re looking to launch a site but the very idea of website design makes you nervous, then you may want to try Fiverr. Simply type “website design” or “website building” in the search bar and you’ll have thousands of offers appear on your screen in seconds. 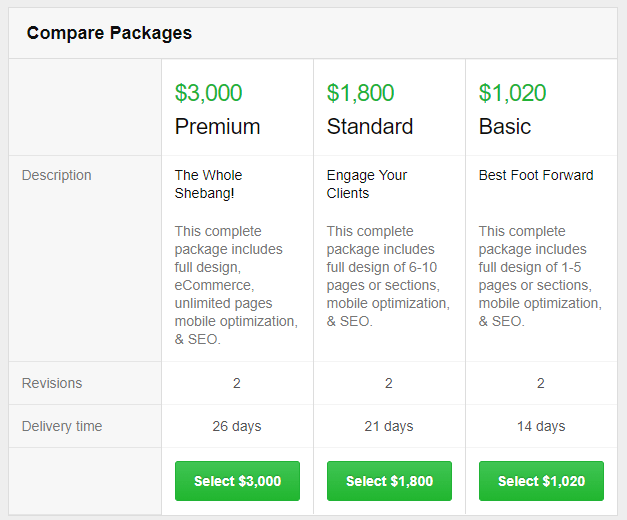 You’ll see dozens of options from Fiverr Pro, along with thousands of other offers. This is the cream of the crop, the doers who have met the rigid criteria necessary to receive the Pro logo. These sellers are vetted by Fiverr to ensure they meet the qualifications and have a portfolio that speaks for itself. You can find a wide range of services under the “programming and tech” section of Fiverr Pro, including boutique web design providers who can create you a one-of-a-kind website that you can truly be proud of. It’s right there in the name - a five spot is enough to buy a gig on Fiverr, and from there, the sky’s the limit. The most basic jobs on the site are going to be on the low end of the spectrum, with the price climbing in line with the provider’s qualifications, portfolio, and quality of work provided. Some suppliers also charge extra for a quicker turnaround. 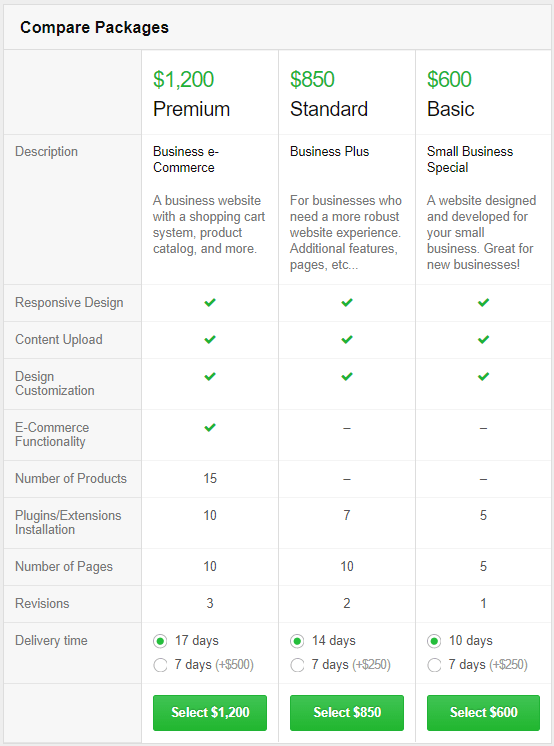 On Fiverr Pro the options tend to be more expensive - due to the fact that the providers have been vetted by Fiverr to ensure that they provide a quality service worth well north of $5. For example, a user named “sociallyadeptso” (socially adept solutions) offers custom made websites, built from scratch with complete SEO, Google Analytics setup, connection to the user’s social media channels, and extensive tutorials for managing your website going forward. The user offers separate packages ranging from “Basic” at $1,020 to “Premium” at $3,000. 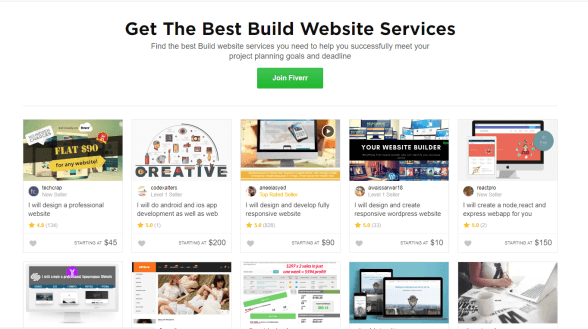 The most affordable Fiverr Pro website building option currently online is provided by a user named “boomlandjenkins,” advertised as a WordPress developer with 20 years of experience building websites. The user offers website building packages from $600-$1,200, and has over 5 years of experience as a provider on Fiverr. Users can also look at reviews from past customers to get an idea of the quality of the product. One thing that definitely defines Fiverr is variety. On Fiverr, there are currently almost 1,500 providers of WordPress site design, 1,161 who offer full website creation, and dozens offering ways to tweak and customize a pre-existing site to your liking. There is a wide range of options for customizing your search, and you can filter by price, delivery time, and language, among other parameters. For instance, if you limit your search just to providers who design sites for $5, you get hundreds of results at the lowest price possible. ; If say, your budget is $200, you can set the search to providers who charge $200 and quickly start combing through over 125 providers who charge a price that is exactly the same as your budget. If you like window shopping, and putting in some due diligence before breaking out the wallet, Fiverr is a great site for you. On Fiverr Pro, creators invest a lot of time and effort into creating ads that feature rich images of their work. You can stroll through the pictures to get an idea of some of their creations, and also view customer reviews. The creator pages also include a frequently asked questions section at the bottom where you can ask a variety of questions such as, if you can do multiple custom wordpress sites, if website hosting is included, and will the website they create be mobile-friendly. You can also scroll through other postings by the user, and get an idea of how versatile they are. In addition, a number of Fiverr Pro creators also will provide a free consultation and walk you through the process, so can decide whether or not they’re the provider for you. With the sheer volume of providers on Fiverr, you can really invest your time combing through the profiles until you find one that really speaks to you. Buyers and sellers on Fiverr don’t sign contracts on the gigs, but there is a set of terms of service that both agree to in order to keep things running smoothly. First off, Fiverr allows only registered users to post gigs on the site, so it’s not a total free-for-all. When a buyer finds a gig they’re interested in, they make a payment to Fiverr first for the cost of the gig, and a commission is sent to the creator. Sellers are required to fulfill the advertised gig and if they cancel without cause, it can be reflected on their user status and reputation, which can help their ability to sell gigs down the road. The seller must deliver the product in keeping with the description in the ad and according to the advertised deadline. Once it is delivered it’s marked as complete by the orderer, who then can rate the seller. Sellers must also scan all transferred files for viruses or malware. That said, Fiverr is not responsible for any damages that may result from using the products. After a buyer receives the work they ordered, they receive all rights for it, though Fiverr retains the right to use all published and delivered works for their own marketing and promotion. Fiverr maintains the right to cancel orders if the seller is late or unresponsive for more than 24 hours after the order has been marked as late. Fiverr will also intervene if users are abusive to one another or if there are trademark or copyright issues involved with a product, or if the seller is withholding an order and/or demanding more money than the original agreed-upon price. Cancelled orders are refunded to you. Fiverr actively encourages buyers and sellers to try and settle conflicts amongst themselves, including by using the Resolution Center tab in the order page. If for any reason this fails, users can contact Fiverr's customer support department for assistance. With so many buyers and sellers working in all types of fields, Fiverr has an extensive customer service department just like you’d expect. The site features an extensive knowledge base and frequently asked questions section where buyers and sellers alike can find answers to all types of issues involved in using the site, and can get step-by-step instruction. The support section allows you to join a community of users who you can contact on a series of forums that all update constantly. There is also a blog run by the company where you can get answers, and if that fails, you can reach out to the company through a contact form on the website. The customer service department can also get involved in the event that there is a dispute over a purchased gig. Though Fiverr encourages users to work out any issues amongst themselves, they are available for assistance if needed. If you’re looking to design a website with Fiverr Pro, the site makes it easy for you. It first asks if you need to update an existing one or create a new one. You are then asked if you need help just with design or code, or if you’d like both, and whether or not you need to design just a landing page or a mobile app, or both in addition to a full website. It’s really all up to you. You enter in what you’re looking for and you’re instantly put in touch with designers who can help you. You can also just go directly to the search bar and type in “website design” and it will bring up all options. Then click “show PRO gigs first” on the left-hand side, so the top-of-the-line options come first. This is a true made-to-order service, so you can rest easy when it comes to designing your website. Fiverr has put a turbobooster on the gig economy and has opened up a whole new world of opportunities for creators and customers alike. People can - within moments - find all types of creative people to help them pursue their vision at a price that works for them, and that is especially true for website building and design. With Fiverr Pro you can commission premium website design that will give you a website that can compete with those of major corporations and leading design houses. It’ll cost you well north of $5, but this is reflected in the quality that is assured by the Pro badge. The possibilities are endless, so take a look at Fiverr and see what you can find.